I am very excited for this weekend! Tomorrow, our beloved Longhorns will be playing the UTEP Miners @ Darryl K. Royal Stadium at 2:30 p.m. We're hoping for a huge blowout, but will be happy with a win! Gotta stay #2 in the BCS! 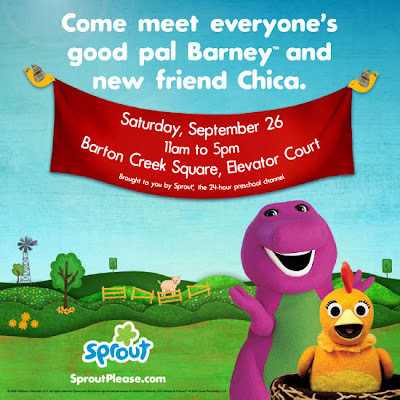 Afterwards, we are heading to the mall to have Bella meet Barney in person! We haven't told her yet, just incase it's insane there, but we are hoping to get a picture of them together! She is going to be so excited to see him live! Sunday is picture day for our family! We've been wanting to get a new family picture taken, so hopefully Bella will do well and we can get a few to hang up on the walls. Overall, a great family weekend ahead! I can't wait! !